In World War 1 a female spy in France used a chess board and chess pieces to code a secret message. The World Chess Championship 2016 is currently going on in New York City. I have taken this as a reason to write a blog post about a chess-related topic. 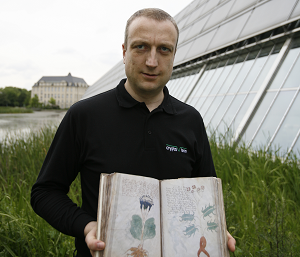 At first sight, this is a difficult task, as there are few if any contact points between cryptology and chess. The only one I can think of at the moment is the so-called chess grandmaster problem – an analogy that illustrates how a man-in-the-middle attack on certain cryptographic protocols works. However, the connection between this problem and chess is only loose. But while the relationship between chess and cryptology is almost non-existent, there are many contact points between chess and steganography (hidden communication). 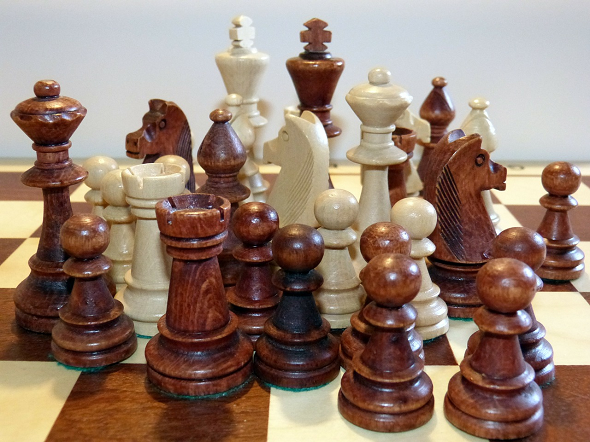 Most of all, steganography can be used for cheating in chess. I covered this topic three years ago in two articles on Klausis Krypto Kolumne. In addition, chess positions and chess notation can be used to hide all kinds of information. For this reason, sending chess moves by mail was forbidden in the USA during World War 2 – the authorities were afraid of German and Japanese spies, who were spuspected to use this kind of secret communication. While I don’t know if chess codes were really used in World War 2, I found one story from World War 1, in which this was the case. The source is an article in Everybody’s Magazine (issue January-June 1918). The main character in this story is an actress, who was living in France in the time of WW1. She was interested in chess. When she befriended a young attaché of a foreign embassy (the article doesn’t say which one), one of her first inquiries was whether he knew any authority on chess in his home country. He did not. But he discovered that there was a chess club of some international pretentions. One day the actress showed the attaché a sketch of a chess problem. Most chess problems are of the kind “white is to checkmate black in two moves”, but this one was different. Here the question was: What opening has been used, in order to leave the pieces on the board in this position? The actress asked attaché to forward this chess problem to the club, and requesting them to solve it. He wrote a letter to the club, enclosing the sketch in the embassy-mail. However, the French Government got hold of the letter. They brought the thing to the attention of the embassy. The attaché made his explanation, which the authorities were inclined to believe. They kept a tab on the actress of whom they had some suspicion. They discovered that on the day the sketch was made, the actress had visited a hospital, in which there was a German aviator who had been shot down back of the French lines. Following this clue codebreakers could decipher the chess picture. It proved to show the position of a large body of French reserves massed behind the lines. The French Government knew that the German headquarters had a survey of this portion of France. It had been made many years before the war, and a copy of the survey was in the possession of the War Office in Paris. This survey laid the country out in squares. These squares were found to correspond to the usual squares on a chess board. By taking into consideration the character of the armed forces occupying these sections behind the French lines, they were able to determine what each chess piece stood for. 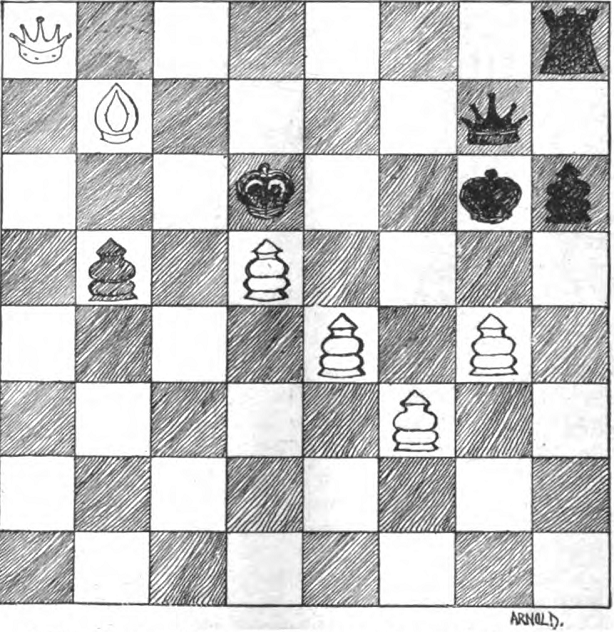 It then appeared that the sketch of the chess problem was, in fact, a map showing the exact position of the whole French reserve forces: pawns representing infantry; queens, field artillery; kings, heavy artillery; bishop, air division; rook, military headquarters. I know the Russians used to do that during the Cold War. The methodology was standard in their military training manuals. Though I could not find it anywhere. This is the first time I’ve heard of this story. Meiner Meinung nach hat der Krimiautor Post zumindest die Hintergrundstory aus Teilen der Mata-Hari-Geschichte zusammengeschustert, der Prozess von 1917 war 1918 noch in frischer Erinnerung. Die Übereinstimmungen fallen auf: Mata Hari war Tänzerin (Posts blumenreiche Beschreibung: “one of the most charming personalities in the whole tinsel kingdom of Cockaigne”), der Attache (im Fall Mata Hari: Major Kalle) und der im Lazarett liegende abgeschossene Pilot (im Fall Mata Hari: Leutnant Maslov). Ob Mata Hari Interesse an Schach hatte, ist nicht bekannt. Woher Post auf die Sache mit dem Schachproblem kam, ob er sie schlicht erfunden hat, ist aber unklar. One has only to look-up “Bletchley Park” and “chess” to uncover some of the many connections between chess and cryptography. In der Einleitung müsste es “pieces” statt “peaces” heißen. Ad Schach und Spionage: Der erste Schachweltmeister wurde in den USA auf seines telegrammisch ausgetragenen Fernschachkampfes gegen den Russen Tschigorin aufgrund vermeintlicher geheimer Codes verhaftet, da die Schachnotation den übermittelnden Postangestellten überaus verdächtig vorkam. (Und den dazugehörigen Wettkampf über eine Eröffnungsvariante verlor Steinitz noch dazu). Ad Kodierung: Allen Schachspielern wäre die Unmöglichkeit der Lösung schon sofort aufgefallen, da in der Stellung schon der weiße König fehlt, es insofern keine regelkonforme Lösung geben kann. Und die Frage nach der Eröffnung offensichtlich nicht rekonstruierbar ist, leider wieder ein Beispiel für eine nicht so gute Umsetzung des Themas Schach und Literatur/Film/etc. @Etez: Danke für die Hinweise. Das ist spannend. Ist das diese Geschichte? Der weiße König steht auf d6. Ist nicht ganz so gut zu erkennen.